Banners are hanging everywhere! You can find them at birthday parties, sporting events, schools, hospitals, and store fronts the list goes on and on. They are a great way to promote a special event or sale. Maybe you purchased an awesome looking printed banner and now you have to figure out how to hang it. By the end of this article you will have all the information needed to hang strong banners in just minutes. A common way to hang a banner is to use grommets. Grommets are metal rings that are placed along the corners and edges of banners. In order to install grommets you will need a grommet machine. Grommet machines can cost a few hundred dollars and can be hard on your arms and back. Once the grommet is punched into the corners you use rope, zip ties, or bungies to hang the banner. 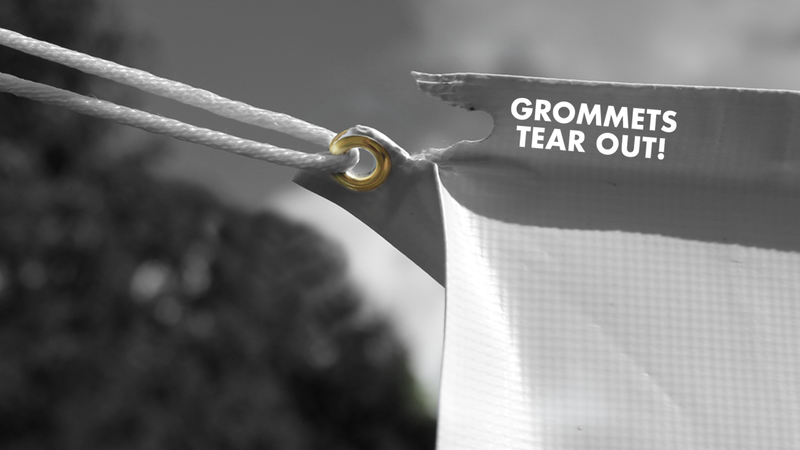 Grommets are usually made of metal and look strong but, used by themselves, without reinforcement, they can easily tear out of banners in windy conditions. In order to prevent this, you must reinforce with a hem by doubled sided tape, sewing, or welding. All of which are time consuming, and the last two require expensive, sometimes finicky equipment. Sewing is the lowest cost alternative for only the highest volume manufacturers (several thousand banners per day) who can afford a maintenance person. For most others, welding is the best option. Banner welders can be purchased in a range from under $2000 up to $30,000 or more. Want to know the difference? Throughput! At the low end they are not much faster than manual. At the high end, they are. At the end of the day, most people find that grommets require a significant investment of time and equipment to install. And the bad news is, they often still fail. We have the perfect solution to eliminate all hassle when hanging banners. The Banner Upsadhesive bannertabs allow you to hang any banner without having to install grommets or having to purchase an expensive grommet, sewing, or welding machine. You can finish your banner so much faster and stronger using Banner Ups. Banner Ups products are made from a strong polymer materials coated with pressure sensitive adhesive. Basically they are very strong plastic pieces that stick to the corners and edges of banners. Just peel, stick, and punch a hole through the tab and your banner is ready to hang. For larger banners, Banner Ups PowerTape can be used to get the strength of a sewn or welded hem (and more!) without the time or expense. Is the banner going inside or outside? Inside banners only need tabs or grommets but if the banner is going outside you are going to want additional support around the banner edges. Typically, as mentioned above, double sided hemming tape is used to fold all four edges of the banner, then a grommet is punched in the corners. Hemming double sided tape takes time and can be another hassle when trying to line up the fold. We offer a single sided banner Hem tape called PowerTapethat is made of a super strong film. PowerTape is simple to use. 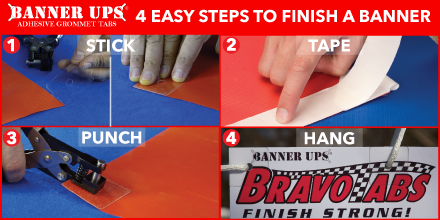 Just apply it to the back of the banner along the top and bottom edges, use a Banner Ups PowerPunch to punch the hole, and you’re done, no folding needed! In three minutes, your super-strong banner is ready to hang. Someone get some rope! It’s time to move on to your next profitable job, now that this one is in the books! It’s that easy! If you have any questions about using any Banner Ups product please contact 1-800-869-9601 or email us at customerservice@bannerups.com. Now get out there and hang those banners!